Are you looking to repair or replace your garage door opener? Patriots Overhead LLC has the tools and knows how to use them! Serving local residents and businesses since 2014, Patriots Overhead LLC has the experience to provide you with a garage door opener that fits your needs and your budget. What is the best garage door opener for my house? 1. 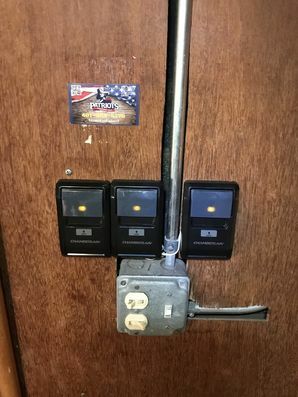 Screw Drive Garage Openers: These are the least expensive door openers, but they are noisy, and more maintenance involved. They work best where the temperature is at a constant. Generally not recommended because they require more maintenance. 2. Chain Garage Door Openers: Many budget-minded homeowners and businesses choose to go with a chain opener. They are good for detached garages because the operation can be noisy. They are generally reliable and easily maintained. 3. Belt Drive Garage Door Openers: Often the preferred type. These are great for attached garages because they are quiet. Belt doors are just as reliable as chains but much quieter. They cost a bit more, but if you have bedrooms near the garage, it's well worth it. If you require repair of your existing garage door opener, give Patriots Overhead LLC a call at (401) 384-6384. Most times, we come prepared to fix your opener on the spot, as we stock our trucks with common and not as common parts. We can repair any time of garage door opener.